Top posts of 2018: It’s ok to critique dockless bikeshare. It’s not ok to be bigoted. This article was GGWash’s third most popular post in 2018. If you like what you read, please support our journalism by joining the GGWash Neighborhood, our membership program. You contribution keeps our blog going, and also connect you to our community of readers. Join today! Dockless bikeshare launched in DC back in September and will continue until April, when the District Department of Transportation will asses the impact of the “demonstration project” and decide its next move. The colorful bikes quickly became popular with riders across the city. Then almost as quickly, there was a backlash. Some of the complaints are warranted — badly-parked bikes may be a mere annoyance for some, but a genuine obstacle for those with mobility challenges and/or visual impairment. Others are irritated when people bring the bikes inside their homes but they still show up on the app as being available for use. However, other complaints seem downright suspect. Why are you assuming that bike is stolen? 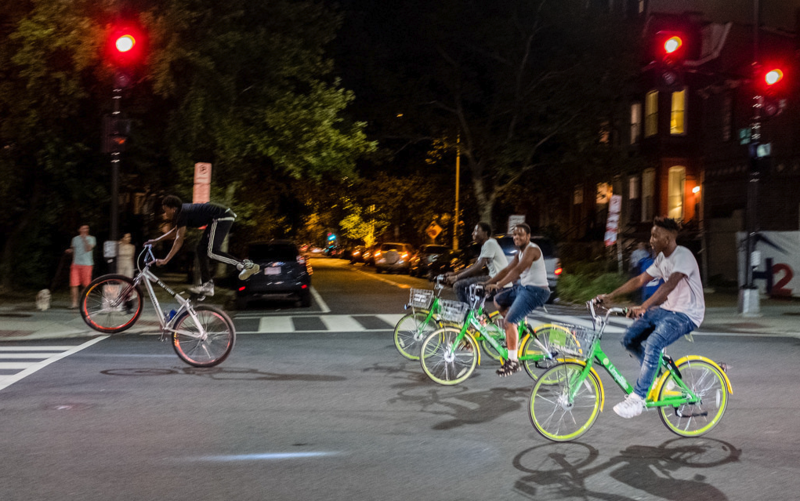 Dockless bikeshares seem especially popular with teenagers in DC — as a recent CityLab article pointed out, with black boys in particular. (It’s worth noting that the companies do not collect this type of demographic data about their users.) There’s been a lot of Twitter and comment speculation about whether many of these dockless bikes are stolen — though there’s no proof of that. The Twitter and comment grumblings came to a head the other week on a Georgetown listserv, when a disgruntled resident urged neighbors to call the police to report dockless bikeshare users merely for riding down the street. “Provide a physical description of the rider, color of the bike, direction of travel, and state the assailant suspect is ‘acting suspicious,’” the post read. Then a local ANC commissioner sent out a notice through the Petworth listserv about “unsightly presence in unusual locations,” “criminal elements that result from [the bicycles’] presence and locations,” and hand-wringing over the “ease of movement/escape from watchful eyes and law enforcement” — a dog whistle if I’ve ever heard one. We may not like it when we see them in the middle of the sidewalk or blocking a door. However, riding a dockless bicycle is not illegal, and we should be thoughtful about our assumptions and critiques. There are many alternatives to complaining on Twitter or calling the police. If you see a bike blocking the sidewalk, do what you can to move it over. The bikes are lighter than Capital Bikeshare bikes and moving them out of the way is not hard. Do your part as a user too. If you want to ride a bike home, leave it outside so that people can get to it. Even though companies are encouraging you to ride them wherever, they still track their locations and someone may be depending on the bike being where it says. It is especially frustrating after a late night riding the bus home from work to not find a bike where the app said it would be. Third — particularly for those of us who are urbanists — why do we care so much that people are riding bikes? Isn’t the mass adoption of cycling what we wanted in the first place? Let’s continue to work with the National Park Service, private business, and other local governing bodies to find the right balance between how many bikes we really need, verses how many are there just in case. Local organizations like WABA and Black Women Bike are helping users get better at riding or learn to ride for the first time — if this issue is important to you, why not join them or otherwise support their work? This will shake out as dockless bikeshare companies continue to track usage and help riders better use their systems. In the meantime, it’s ok to acknowledge that this is an experiment, and it hasn’t always gone well. There have been rightful critiques about waste from dockless bikeshares, particularly in China. Companies like Zagster and SoBi were offering dockless bikes years ago, but working directly through cities, counties, and private businesses to put them out on the streets similarly to docked systems. This freewheeling rollout is new for all of us, and constructive criticism is a good thing. However, what’s not acceptable is the continued demonization of the companies that have tapped into a need and the people — especially the young black male people — who are taking advantage of this new technology and making it their own.